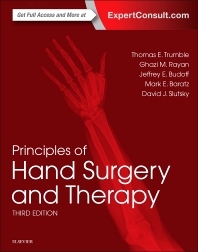 Ideal for hand surgeons, residents in a hand surgery rotation, and therapists interested in a review of surgical principles, Principles of Hand Surgery and Therapy, 3rd Edition, by Drs. Thomas E. Trumble, Ghazi M. Rayan, Mark E. Baratz, Jeffrey E. Budoff, and David J. Slutsky, is a practical source of essential, up-to-date information in this specialized area. This single-volume, highly illustrated manual covers all areas of adult and pediatric hand surgery and therapy, including the elbow. Both in print and online, you’ll find state-of-the-art basic science combined with step-by-step techniques and therapeutic protocols, helping you hone your skills and prescribe effective long-term care for every patient.